This is the perfect course for beginners to learn more about connecting to web endpoints, handling CORS errors, different options for HTTP requests, handling data, and iterating through it to output within a web format. The focus of this course is on practicing and learning using an API through a unique, fun exercise of building a crypto currency information application from scratch. 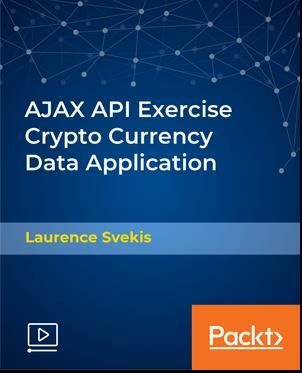 Cryptocurrencies are really popular and with many web APIs, this course is ideal for you to see how to get that data into your own application. First, we'll set up a local server using Express. Then we'll practice AJAX requests locally and avoid local CORS errors, then send requests from the back end. Further on, we'll use request to connect to web APIs and jQuery AJAX shorthand to connect to web APIs. Then, you'll see how to add jQuery UI to create quick and cool functionality within your code. There are multiple ways to make AJAX requests, including fetch and jQuery, so we'll explore all of these, then move on to retrieve and update the API data on the back end before it comes to the front end.